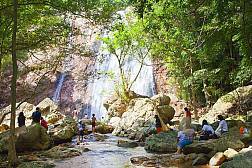 There are several waterfall locations on the island of Koh Samui and certainly Na Muang is one of the most impressive and well developed. Located in the southern part of the island it is about 10 kilometers away from the port town of Nathon. The waterfall is actually in two parts. 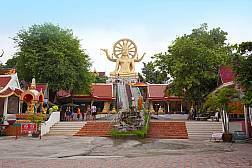 The impressive giant golden statue of Big Buddha is probably one of the most well known landmarks in Koh Samui. 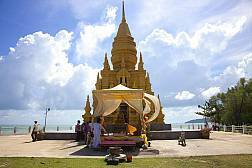 Visitors flock from around the world to pay respect to this 12-meter tall representation that also sits on a raised peninsula, giving visitors a fantastic view of Koh Phangan and the surrounding beaches. 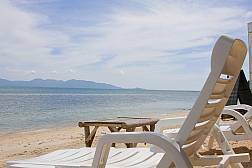 Bang Por Beach is situated on Samui's northern coastline and is popular with those who enjoy untapped paradises. 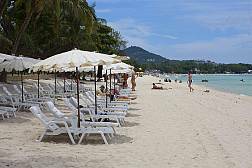 Chaweng is the most popular holiday destination in the whole of Koh Samui, which pretty much makes Chaweng Beach the island's most crowded. 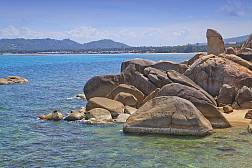 However, the beach is still simply beautiful and nowhere near as commercialized as some of the beaches in Pattaya or Phuket, so still seriously worth a visit. 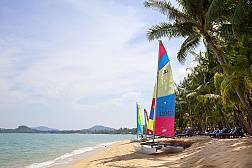 Situated on the north-western coast of Koh Samui, Choeng Mon Beach is famously known as one of the most beautiful and peaceful,stretches of sand in Koh Samui. 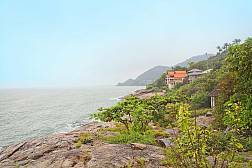 Famous for its more hedonistic formation and appearance, Hin Ta and Hin Yay, also known as Grandfather and Grandmother Rocks are one of those famous places that everyone who visits the island should see. 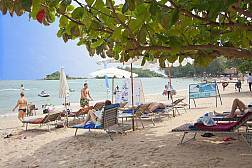 Aside from being one of the most stunning stretches of sand on Koh Samui, Lamai Beach is popular with tourists, but is much more peaceful and laid back than other more commercialized beaches such as Chaweng. 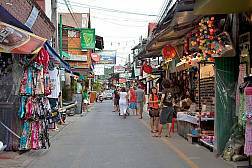 Fisherman's Village in Samui is located in the Bo Phut area of the island on the northern coastline and is home to a great selection of restaurants, bars and shopping options. 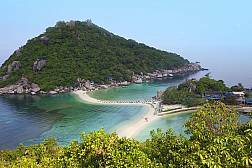 Namuang is one of the most stunningly beautiful parts of Samui, situated on the south-east of the island. If you are on holiday with your family, a visit to Namuang Safari Park will ensure you are popular with your children for the rest of the holiday, at least. 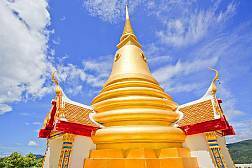 Nestled in a hillside location next to Chaweng, Khao Hua Jook is an awe-inspiring temple in Koh Samui. 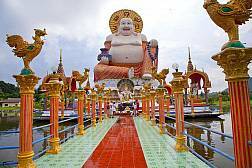 For a better and more meaningful understanding of Thai culture and religion, this is a very nice place to visit. Quite possibly one of the most beautiful spots in Koh Samui, located at the southern end of the island, this impressive chedi within close proximity to the beach really is breathtaking. 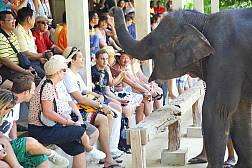 For a vast array of animal shows, a tiger zoo and an aquarium, Samui Aquarium and Tiger Zoo is a fun filled day for you and your family on your holiday in Koh Samui. 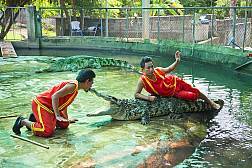 If you enjoy wildlife and animal shows, you simply must visit the Koh Samui Crocodile Farm. 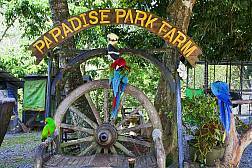 This is one of the best family attractions on the island. 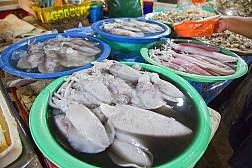 For the best and freshest seafood in Koh Samui, the Bang Rak Fish Market really is something special and well worth the visit. Invite yourself into the hustle and bustle and enjoy a real authentic Thai experience. 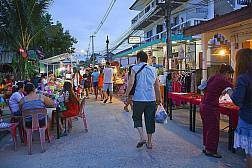 Visiting markets in Thailand is always fun and there is none better than Lamai Night Market to find that special gift to take home or for a spot of local food. 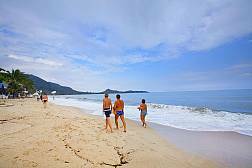 Maenam Beach is one of the most beautiful beaches in Koh Samui. 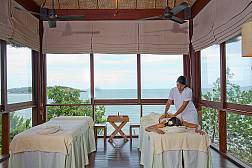 It really is a great place to relax and take in the tropical surroundings. 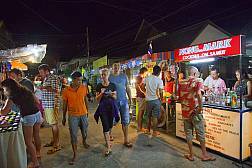 Maenam Night Market takes place every Thursday evening. The market really lights up this sleepy area. With a great selection of food, clothes and handicrafts, this is a place you can get a real bargain. Set in glorious tropical rainforest surroundings high on Khao Pom Mountain, Koh Samui’s Paradise Park Farm offers a unique holiday experience including hundreds of bird species, animals, a huge infinity swimming pool, shady walking trails, great food, a kids’ playground and much more for the discerning visitor. Football and golf rolled into one sport I hear you ask! That's right! 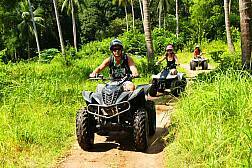 At Samui Football Golf you can partake in this fusion of sports which will lead to an interesting afternoon's fun for the family or friends. 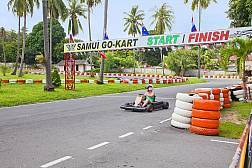 Go cart like a true Formula One great at the Samui Go-Kart track at Bophut Beach in Koh Samui. Enjoy a high-octane couple of hours on this purpose-built track. 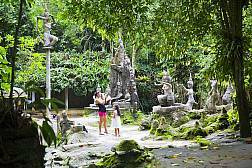 The mysterious world of the Tanim Waterfall Magic Garden is a haven for those who enjoy tropical nature at its finest. 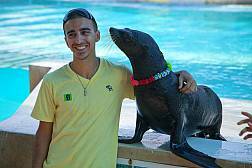 You, your traveling partners or your family will have a great time exploring the gardens. Rockpool Restaurant at Cheong Mon in Koh Samui is one of the finest upscale fine dining restaurants the island has to offer. 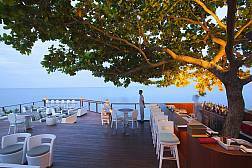 For the best food and ambiance on the island, this restaurant is a great choice. 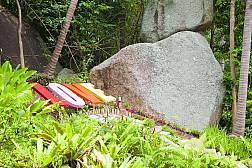 You don’t have to be a total romantic, or wait until February 14th to visit the Valentine Stone on the beautiful island of Koh Samui because the park it sits in is open year round! 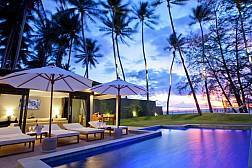 Nikki Beach Samui is one of the island’s most exclusive beach clubs and resorts. Located on the pristine shores of Lipa Noi Beach, on the Western coast of Koh Samui, the stunning venue offers high-end accommodation, a luxury spa, first-class dining and a chic beachside nightclub.